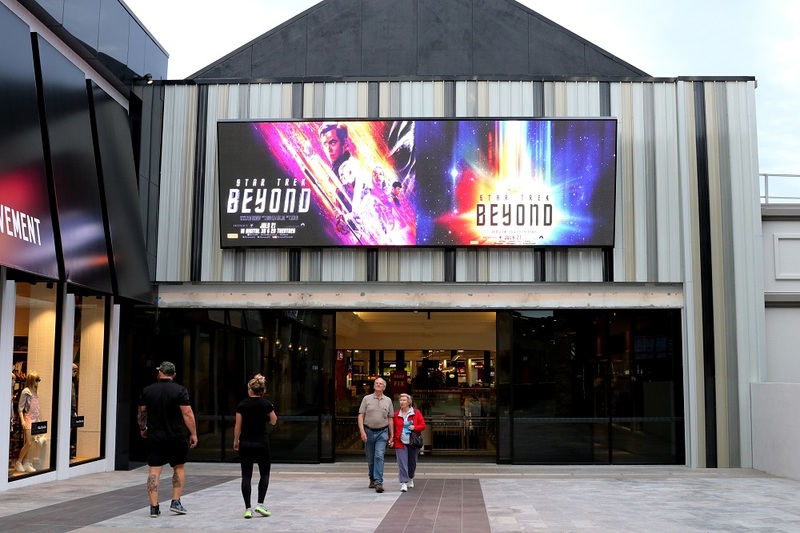 PCB Digital (PCB) in collaboration with Digital Place Solutions (DPS) has delivered a brilliant external digital display for Australia’s 4th largest shopping centre, Pacific Fair, Gold Coast, Queensland, Australia. Situated externally in Pacific Fair’s vast new resort precinct, the location presented specific needs. The north west orientation bathes the location in direct sunlight for a number of hours each day and the positioning of the display over a key door entry is in close viewing distance for shoppers with many viewing angles. The landscape format LED display is designed in to the building façade, positioned immediately over the entrance to the eastern wing of the centre. This prime location ensures every shopper in the zone is attracted to the marketing messages displayed in high resolution throughout each day. The location demanded high brightness, full external rating and high resolution image capability. Landscape format; 8.16m Wide x 2.56m High; 20.9 sqm. in face area. PCB will provide ongoing programmed service for AMP Pacific Fair.